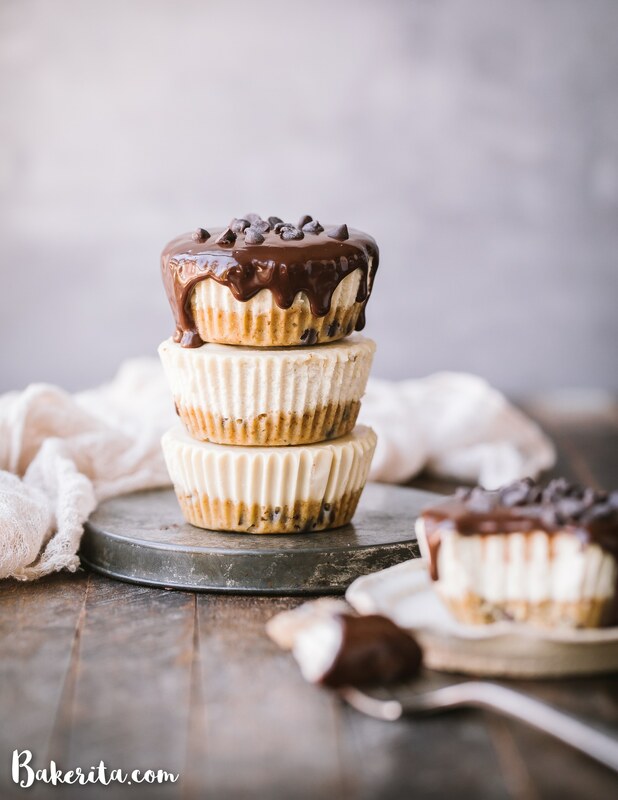 In these No-Bake Vegan Chocolate Chip Cookie Dough Cheesecakes, vanilla cashew cheesecake tops a gluten-free & paleo chocolate chip cookie dough crust. 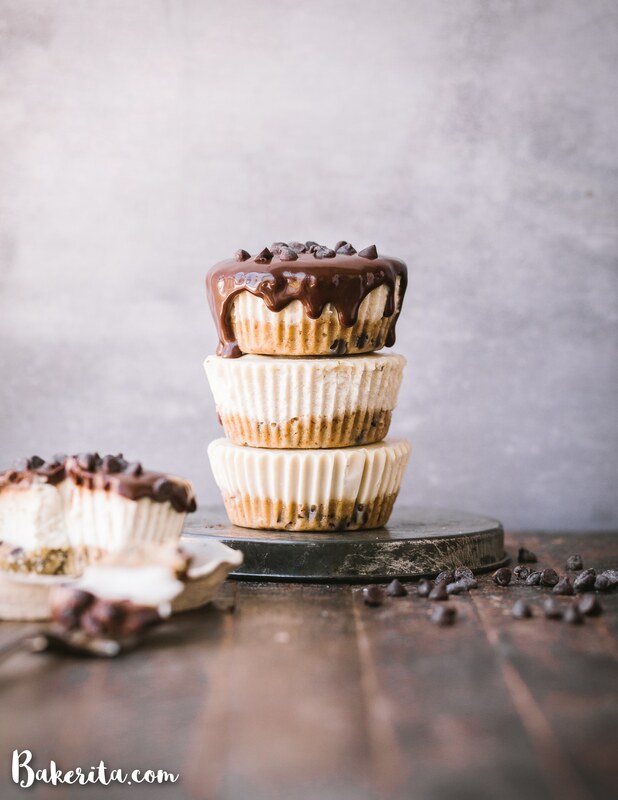 Topped with dark chocolate ganache, these mini cheesecakes make a decadent treat you’ll make again and again! So, I moved into a new house on April 1st. This is the last recipe I photographed in my last apartment that I’ve got left to share. It was also one of the last things I made in that apartment, period. 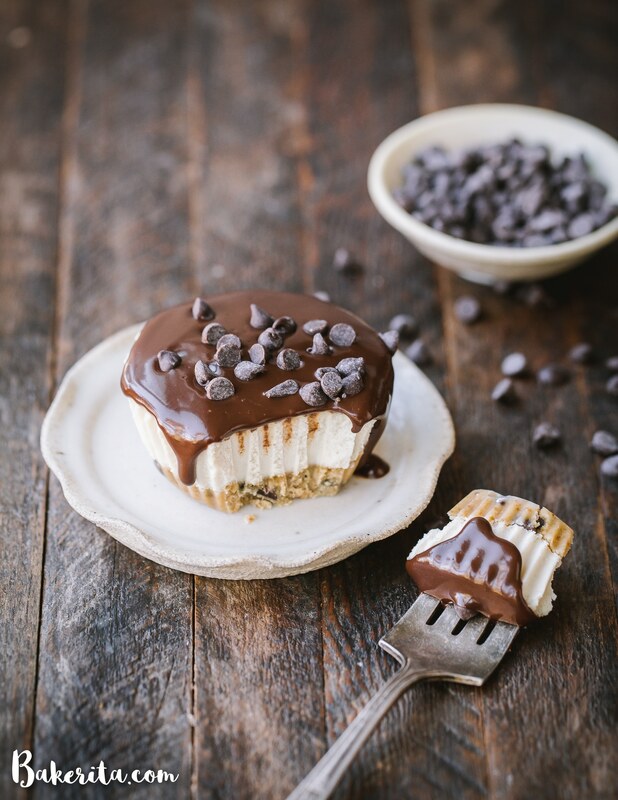 A little bittersweet, but that means these Vegan Chocolate Chip Cookie Dough Cheesecakes carry a little extra nostalgia for me. 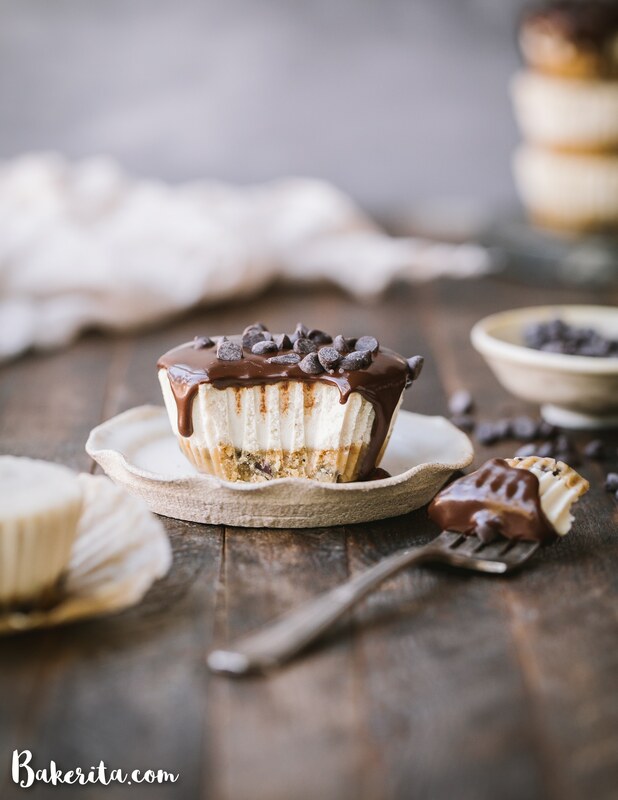 No-Bake Vegan Chocolate Chip Cookie Dough Cheesecakes! 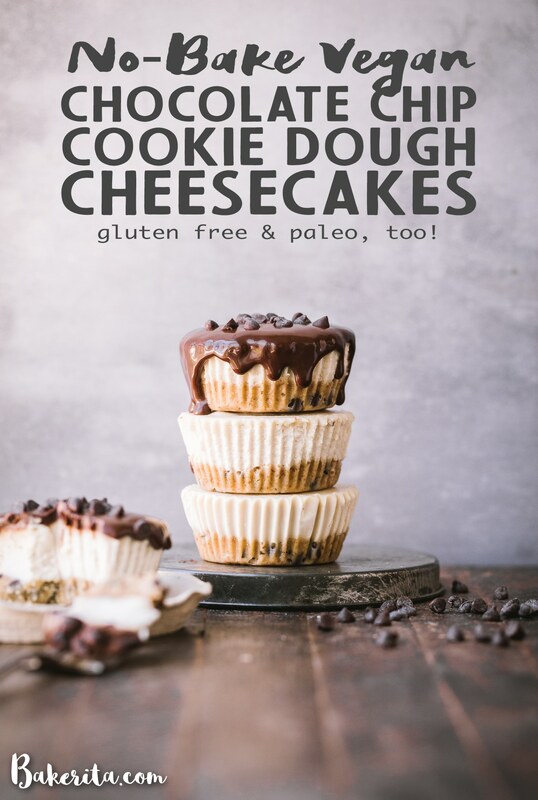 Cookie dough is always a favorite of mine – whether it’s eating the dough from my paleo chocolate chip cookies straight from the bowl, or making all of the cookie dough flavored treats. 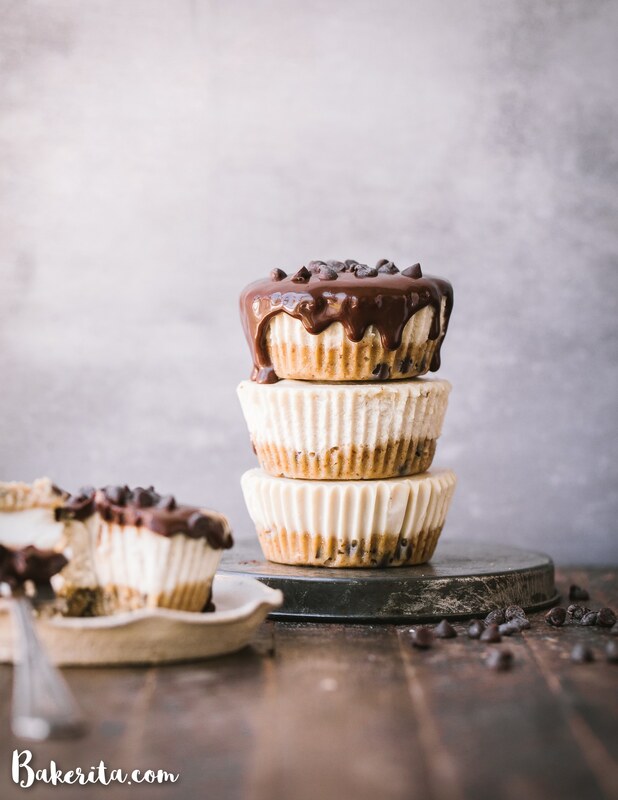 For these Chocolate Chip Cookie Dough Cheesecakes, the crust is essentially just vegan, no-bake cookie dough. It’s mixed together quickly and then pressed into the bottom of some muffin cups (OR you can make a big one in a 6″ springform pan). Make sure you get a THICK layer in there – we want maximum cookie dough here. A simple cashew-based cheesecake filling tops the delightfully thick and scrumptious cookie dough crust. It pairs perfectly with the cookie dough. The vanilla flavoring of the cheesecake complements but doesn’t overwhelm the cookie dough. After the layers of cookie dough and vanilla cheesecake, top the chilled cheesecakes with a luscious (and super easy!) chocolate ganache. To make the ganache dairy-free, we use coconut milk instead of heavy cream. It brings an extra layer of delectableness to the recipe. You can use a 6″ springform pan instead of a muffin tin for a larger cheesecake, instead of individuals. Make sure to use muffin liners so you can easily remove your cheesecakes from the plan. You’ll need a high-powered blender or food processor to make the filling – I use (and LOVE) this Vitamix Explorian Blender, which always gets it super smooth and creamy. Line a muffin pan with 8 muffin/cupcake liners. You can also use a 6-inch springform pan for a larger cheesecake. Set aside. For the crust, combine the coconut oil and coconut sugar in a small mixing bowl. Stir until combined. Add the vanilla extract, salt, and milk and stir in incorporate. Mix in the almond flour and chocolate chips. Divide evenly between the pans and press into the bottom. Set aside. In a food processor or high-powered blender, combine all of the ingredients in the filling. Turn the food processor or blender on medium-high and blend for about three minutes or until the mixture is silky smooth and creamy. Divide the filling between the prepared crusts. Place in the refrigerator for at least 2 hours to set completely. If you make one large cheesecake, you will need at least 4 hours to set. For the chocolate topping, place the dark chocolate in a bowl. Heat the coconut milk in the microwave for about 30 seconds, or until steaming. Pour over the chocolate and let it sit for a minute, and then whisk until smooth. Garnish each of the cheesecakes with the chocolate ganache and a sprinkle of mini chocolate chips, if desired. These are just stunning, Rachel! I cannot wait to try them out! And love that chocolate drizzle! Thank you so much, Britt!! These look delicious! Can you use dates instead of coconut sugar? …would you happen to know the calories? One of my favorite desserts ever, I love you Bakerita! Hi there! I’d like to leave some feedback on this recipe. I don’t know you and found this post on an internet search, but I did try to make this recipe, and it didn’t go well. The taste is delicious and the texture is very creamy and rich! But, overall the results were disappointing for trying to make this a single cake. I think it would still be very fragile as small portions, but if you could pop the whole thing in your mouth in one go and could keep it very cold until you eat it, then it might work out. Did you freeze these before taking photos of them? If not, how did you get the filling to set? I followed the instructions exactly, and didn’t even get remotely close to a set texture. Could you give me some tips on how you got such a hard texture that you could stack them? The filling came out liquid. It has no binding agent and the only thing holding it together is the nature of coconut milk and oil which is hard when cold. Even after chilling overnight, it doesn’t set. Liquid + liquid + liquid + oil + nut puree does not come out to cheesecake texture. When you combine that with the rock hard base (when cold), it creates an impossible combo. I wasn’t able to remove it from the 7×3 container that I used. I’m guessing you didn’t actually try to make it as a single cake. I recommend removing that suggestion – it doesn’t work. Without a binding agent, the filling is so fragile that even trying to remove a piece from the pie creates enough heat to turn it back into loose liquid. The base is hard as a rock from all the coconut oil when refrigerated, so trying to dig out a piece of that resulted in large globs of liquid filling all over my counter when the few chunks of the base I was able to remove flew across the counter from all the force I had to use to remove them. I wish I could attach a picture of what it ended up looking like! I had to use my strongest butter knife to remove small chunks at a time, which was the only utensil that didn’t bend. My recommendation – only use this recipe for small bite-size portions. If you try to make a single cake, due to the nature of the ingredients in the recipe it will not hold together and you’ll have a giant rock-liquid combo on your hands like I did. I’m going to pour out the liquid filling (yes, it’s still liquid after 14 hours of refrigeration) and add some chia egg as a binding agent and see if I can get the filling to hold together. Hi Maria, wow alright – let me try to address all of this. I did not freeze them, they should stay firm based on the instructions given unless you changed something about the recipe. I make similar vegan cheesecakes all the time and have never had a problem with them setting (or gotten this complaint from anyone else). You are right – the cheesecakes are kept firm by the coconut oil and coconut cream, which need to be cold to stay firm. The mixture should be very thick when it’s coming out of the blender, though. Did you add any extra liquid? And did you drain and rinse the cashews well before using? Or use liquid coconut oil, which doesn’t firm up? Making it as a single cake certainly will work, you just need to put it in a springform pan for easier removal (as suggested) or line the pan with parchment paper. I’m not sure what you did to make the filling so liquid, because it should not be liquid ever. Even at room temperature, it’s soft and almost mousse-like or a pudding texture. Let me know if you want more help troubleshooting what went wrong. After reading the comment, and then reviewing the ingredients, is it possible that coconut milk was used, instead of coconut cream? If you don’t look at the ingredients closely you will not see that after 1/3C full fat coconut milk it says only the cream on top. Perhaps modify the recipe to read 1/3C coconut cream? Hi Karen, thanks for trying to help troubleshoot. Even if canned full-fat coconut milk was used instead of cream, it shouldn’t have resulted in a liquid like Maria described. Since I haven’t heard back from her, it’s hard for me to troubleshoot any further. I hope if you try the recipe that it turns out fantastic! Five stars for flavor and texture!! I also did not achieve as firm a texture as the previous review, however I did not use refined coconut oil (the only change to the recipe that I made) the recipe called for since I did not want to make a special trip to the store. I suspect the refined oil has different solidification characteristics. My filling set up with more of a firm pudding texture. I will try the recipe again using refined coconut oil since the overall flavor and texture was wonderful. Another thing I wondered about for the person with the liquid filling issue is that maple syrup brands have variability in the viscosity. Therefore it may be that the particular brand used may have added more moisture than the one that Rachel used. Perhaps that is my issue as well. I do love a good mystery!! Will try to remember to comment again when I make another batch. Hi Frandangler, virgin and refined coconut oil solidify in the same way, but there’s also “liquid coconut oil” which doesn’t firm up at all. Good question about the maple syrup, too. I wonder if that may have contributed. So glad you loved the recipe though, and hope it turns out even better the next time :) thanks so much for your feedback! Fixing it now! Thanks for pointing that out!